In one of the episodes of QuickFire of QTV Channel 11, Ched Rosebu Benitez cooked pesto prawns salad with sun pried tomatoes, together with her guest Tere Licaros and Maggie Wilson. This one is very great recipe for those on a diet. If you want to make this recipe try it out, it's so very easy to make, here's the recipe. 1. In a bowl, mix the pesto, sun-dried tomatoes, mayonnaise, and Parmesan cheese. Cover, and refrigerate until ready to serve. 2. Season Prawns with salt and pepper. Saute garlic with butter and add the prawns. Season with Ajinomoto umami super seasoning. 3. Plate the greens and pour the pesto mix. Top with prawns and a few more grated cheese and sun dried tomatoes. 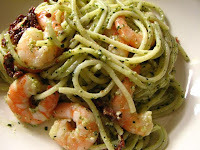 3 comments on "QuickFire, Pesto Prawns Salad with Sun Dried Tomatoes"